The Yampa River winds through Castle Park to its confluence with the Green River in Echo Park. 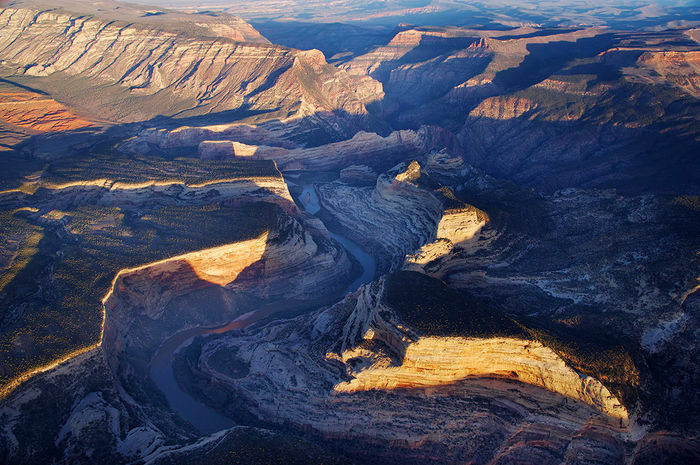 The Yampa is Colorado's second largest body of water and runs wild, apart from a few small dams and diversions. The Green River starts high in Wyoming's Wind River Range and is the chief tributary of the Colorado - the most endangered river in America. Dinosaur is fascinating for it's geography, cultural and ecological significance, and diversity. It was also the scene of a major conservation battle over the proposed damming of Echo Park, with the Sierra Club and The Wilderness Society leading the fight to keep the rivers running free. Photographer Philip Hyde was commissioned by Sierra Club president David Brower for the book This Is Dinosaur in 1955 - he became the Sierra Club's primary conservation photographer. Thank you to LightHawk for providing the aerial support to fly this mission. I met LightHawk volunteer pilot Jim Grady at oh-dark-thirty in Grand Junction, CO last week to fly over Dinosaur National Monument in northwest Colorado. Jim and I flew together once before, over the Gunnison Basin last year, so I knew I was in for a great flying experience with a great plot. Jim has that kind, generous spirit that is typically LightHawk, and will stay out there as long as it takes to get the right images. I was excited to climb into his 1953 suped-up Cessna 180 with the huge window opening – the window just hovers, held open by airflow. My only worry was nausea-inducing turbulence, but there was none of that in the cool, stable morning air. Dinosaur has been on my radar for awhile for the significance of the wild rivers, cultural and conservation history, and its central role as the wild in northwest Colorado. I came to think of Dinosaur in a regional context when I photographed Vermillion Basin and Brown’s Park NWR a few years ago, areas that tie into the Dinosaur complex. Their protection bolsters the ecological sustainability in a region that is under heavy drilling development pressure that could turn Dinosaur NM into a protected island in a sea of industrialized drilling; an ironic twist when you consider the struggle between conservationists and politicians hellbent to dam Echo Park in the ’50’s. I’m mindful of the courage of David Brower, Philip Hyde, and Wallace Stegner as we soar over the confluence and peer into deep canyons slicing the wrinkled landscape of the Moenkopi and Weber Sandstone formations. Those early conservation greats found a way to make Dinosaur matter and kept dams out of all national parks and monuments. The modern threat fragments surrounding lands that sustain the ecosystem and steals millions of gallons of water for every fracked well. The threat may have changed, but the challenge to see the future is no different today than it was in the 1950’s. Aerial View of the Yampa River flowing through Castle Park. Dinosaur National Monument, Colorado. Looking down on the confluence of the Green and Yampa Rivers in Echo Park. The red Moenkopi formation is in the lower part of the frame, with Weber Sandstone above. The Green River enters the frame the north (top). The Green River flows into Dinosaur NM at Gates Of The Lodore and into Lodore Canyon. Try to imagine John Wesley Powell leading his expedition into these unmapped, unknown, forboding canyons and exploring all the way through the Grand Canyon! The Green River Winds through Brown’s Park NWR en-route to Dinosaur National Monument. “Abondoned” Drill pads and service roads long-abandoned remind me of useless parking lots in closed strip malls. In arid sagebrush lands, it takes many decades for vegetation to reclaim sites like this one in Rio Blanca County, CO. The Roan Plateau in the Piceance Basin is heavily fragmented by natural gas drilling around the base and on the western surface. Conservationists are still fighting for the wild public lands on the eastern side and have contested long-term drilling leases. The area was known as the mule deer factory and attracted hunters from all over the world. The herds are down by around 60% and the BLM has plans to drill most of northwest Colorado for decades to come. Wildlife need freedom to roam and the Piceance mule deer herds migrate 40-50 miles between summer and winter ranges. Thousands of new wells, roads to support them, and 1,500 heavy truck trips for every well will forever alter the ecological balance of this region. Is it worth the price? Many thanks to Jim Grady, LightHawk, and to Jackson Frishman for helping me with the lay of the land! Posted in Colorado, Sagebrush Sea on May 10, 2013 May 10, 2013 by Dave Showalter. ← Previous: "Wyoming Range Stormy Sunset"
No, it’s not worth it! Great images, Dave, especially that first shot, which is absolutely top-notch! And your aerial documentary work is eye-opening and important as always. One outing I’d highly recommend for people visiting the Dinosaur area is to drive down to Fantasy Canyon. Besides being quite cool in itself, it’s a very dramatic illustration of what it means to have a small protected island in a sea of energy development. The drive south through the gas fields will provide some serious food for thought regarding the ubiquitous industry claims that modern extraction has become green and low-impact. Similar food for thought is available in the town of Vernal, which since the latest energy boom has sprouted a remarkable crop of billboards advertising services related to meth addiction. Social consequences to rural communities are an area that gets scant attention in discussions of the economics of energy development. Thanks for your insightful, thoughtful comments, Jackson. Your love and knowledge of the Dinosaur area is truly inspiring. It was your photography and book that really got me psyched to photograph it from the air after shooting around Vermillion and Brown’s.